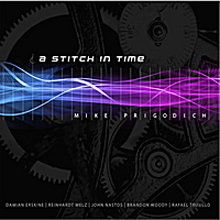 Mike Prigodich's A Stitch in Time comes as a pleasant surprise, not only because the pianist displays astounding technique, but because he dazzles with the dramatic nature of his playing. Yet the drama is no ruse or distraction from the heart of his music, which is highly charged with emotion. This is, of course, reflected in the maddeningly complex compositions he writes. Its architecture is created from a vast musical topography that covers vast swathes of the global soundscapefrom North Africa, Spain and other parts of Europe, the Caribbean and North Americahis musical idioms flowing freely, with the Afro-Caribbean weaving in and out of American folk and European polkas making sneaky forays into the idiom of jazz. In this respect, he is fairly typical of the journey that jazz is making today,as it melds more and more with folk forms from Europe and America. Yet Prigodich speaks a musical language all his own, one born of a voice that elevates his instrument far beyond its realm into one where mystery and magic meet. The zigzag motion of "Chaos Theory" captures this in fine manner. Like a dream voyage painted on a vast canvas, the song unfurls like a magnificent tapestry, with a waft and weft that begins in Moorish Spain and ends up dripping with the waters of the Caribbean Sea. Through it all, the delightful swig of jazz is never very far away. All of this fructifies even further in "Spanish Swordfight" which, despite the rather medieval suggestions of its title, is rooted in complex modern rhythms that constantly and exhilaratingly change throughout the song. Prigodich's penchant for odd meters is well-documented throughout the album, through "At Sixes and Sevens," "The Wizard of Odd" and "Nigel's Theme," all of which appear to centre on Afro-Caribbean rhythms laced with the swing and swagger of jazz. Why dwell on Prigodich's preoccupation with music that can make you laugh and cry, or feel pain and pleasure with just a tinkle of the black and white keys of the piano? Probably because the pianist is driven by its rhythms. He is steeped in its history and although he is not a bluesy musician he is certainly moved by its emotions. His seemingly autobiographical "A Stitch in Time" is tinged with sadness, but eventually rises above it all into a mood that is spectacularly triumphant. This not a blues, but contains the deep emotions that drive the music of Afro-America. There can be no doubt that Prigodich is a precocious talent, of which this album touches but the tip of the proverbial iceberg. It appears that the pianist has poured much into this album and this is a good thing; where he will go next is a matter of conjecture, but it's a certainty that his music is sure to bristle with invention, dynamic tension and excitement.